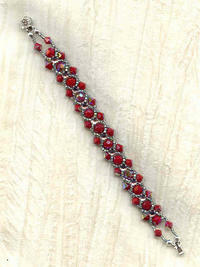 The dark red beads with the aurore boreale finish are vintage Swarovski crystal. Both bicones and rounds measure 7mm. The 5mm light amethyst roses montees are vintage West German crystal. I've woven the larger beads together using swathes of silvery lavender seed beads to make a bracelet approximately 7-1/2 inches long. It closes with a silver plate rose motif slide clasp. Dramatic and feminine at the same time, it's another diva bracelet from SPARKLE PLENTY. The 8mm round and bicone crystal beads are a lovely dove gray with an aurora boreale finish.